In 1998 we established our plant, a 42,000 m² facility situated on a land area of 107,000 m², in Afyon, which is widely considered the heart of the Anatolian marble region. At the same time we also made our first quarry investment at the beige marble quarry in Bilecik, thereby entering the natural stone sector. Since then we have been investing in the marble-rich areas of Turkey, such as Afyon, Eskişehir, Bilecik, Muğla, Burdur and Kaş, and in so doing adding value to our fast-growing sector. With our quality-oriented approach to work, skilled manpower and modern technology, we at Temmer believe we are working today to design the future. As we envision the future outlook and move forward with our new generation technology solutions, Temmer is investing in quality by providing raw materials, products, and service continuity in every way. Each year we extract 300,000 tons of marble in block form from our quarries and process them in our 2,000,000 m² capacity integrated facility before delivery to our customers through our two showrooms in Afyon factory and Istanbul total of 600 m² and world exhibitions. We export 80% of our marble as blocks, slabs and cut-to-size products to around 40 countries worldwide, including North America, Europe, Central Asia and the Far East. In giving our Research and Development activities top priority, we endeavor to increase the variety of our production via processing in blocks, slabs and cut-to-size products. Moreover, we also spend a considerable effort discovering new and rich reserves. In so doing, we become solution partners with architects, designers and project owners by offering them different sizes and characteristics for their surface treatment alternatives. We are able to stay on the cutting edge of state-of-the-art production because we listen to the expert advice of the top consulting services to the world marble industry. In addition, we closely monitor all the innovations and developments in our industry in order to continually improve our production. Instead of the more common synthetic materials used around the world, our vision is to extract and process natural stone so that we can provide people a more natural habitat. In addition, at our high capacity water treatment plant we transform 16,000 liter into clean water so that nature and our environment are not damaged in any way. Furthermore, we are helping in our nation’s fight against erosion by planting trees in collaboration with the TEMA Foundation in order to preserve the natural order around us. Whether serving customers in Turkey or in the international arena, our aim at Temmer is to bring precious raw materials to our plant and, utilizing our skilled people and commitment to quality, produce superior marble stones which in turn are used to supply beautiful projects around the world. As one of the leading natural stone companies in both Turkey and the world, this is our primary vision. In all our production ventures, we utilize only our own financial resources and are therefore proud of adding value to our nation’s economy. By passing on our knowledge and expertise to the following generations, and by working hard to maintain our high leadership position in the world’s natural stone sector, we at Temmer are happy to be making a positive contribution to Turkey’s development. Rustem Cetinkaya was born in Istanbul, Turkey in 1977 and graduated from Istanbul Bilgi University, Faculty of Economics and Administrative Sciences. 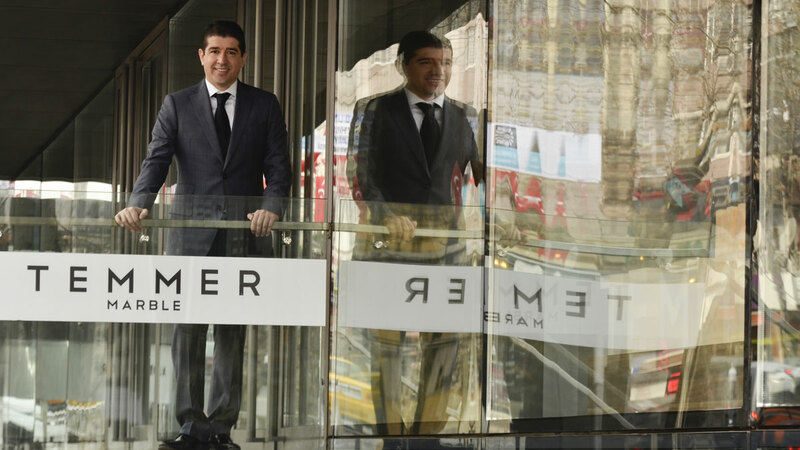 Established TEMMER MARBLE in 1998 Cetinkaya serves as the Chairman of the Board since then. Çetinkaya, who served on the of the board of directors of IMIB – Istanbul Mineral Exporters Union from 2014 – 2018, since 2018 has been Vice President of the board of directors for 2 terms and is currently of Turkish Exporters Assembly a Member of Sector Councils and TIM AS, Turkish Trade Center; Board of Directors. Besides this, Cetinkaya’s involvement in social responsibility extends to various foundations and associations. Cetinkaya is also lecturing at the universities to next generation architects and engineers about natural stone as part time teacher. Cetinkaya is involved in the education business to meet the needs of the workforce in Afyonkarahisar’s Organized Industrial Zone, started education in mechatronics and metal fields since 2017-2018 at ARAL ANADOLU TECHNİCAL VOCATIONAL HIGH SCHOOL. Rustem Cetinkaya is married and the father of two.